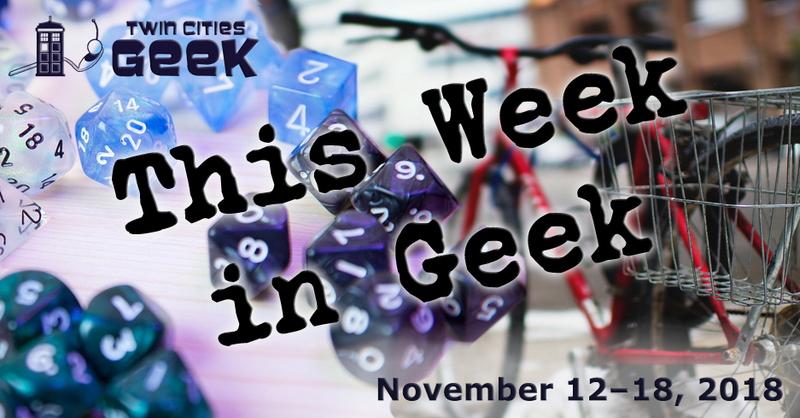 Welcome to This Week in Geek, your guide to events of interest to the Minnesota geek community for the week of Monday, November 12th to Sunday, November 18th. When: Monday, November 12th at 6:30 p.m. When: Tuesday, November 13th at 5:00 p.m. This weekly event gives students a 50-percent discount to the VR Menu at REM5 Virtual Reality Laboratories. This is a great opportunity for students of all types (K–12, college, etc.) to explore virtual reality in a great location. There’s a wide variety of possibilities here, including fun, education, and more; see the website for more details. When: Tuesday, November 13th at 6:15 p.m.
Books and Bars is an “open public book club show” hosted and moderated by Minnesota Public Radio senior producer Jeff Kamin that provides attendees with “a unique atmosphere for a lively discussion of interesting authors, fun people, good food, and social lubrication.” The book being read and discussed this month is The Handmaid’s Tale, a dystopian science fiction novel, following a young woman living in sexual servitude in a theocratic police state within what was once the United States. The recent Hulu adaptation and political climate have made Margaret Atwood’s novel as relevant as ever before. When: Tuesday, November 13th at 7:30 p.m.
Come and experience YogaQuest, a blend of yoga and fanfiction storytelling led by certified yoga instructors. Experience a yoga workout experience and a story at the same time. The theme for this week is to be determined, so be ready for anything! Check back on the website for more information. This event costs $15. When: Wednesday, November 14th at 7:00 p.m. When: Thursday, November 15th at 6:00 p.m.
Minneapolis Institute of Art continues the free Third Thursday series with an evening of discovery via literature and art to celebrate the opening of a new special exhibition, Egypt’s Sunken Cities. This is your chance to learn about ancient Egyptian gods, myths, and more through artifacts pulled from cities once swallowed by the sea. This event is free and open to the public, and there will be music from Vie Boheme, a cash bar, and activities. Check out our recent article on this new exhibition for more info! When: Thursday, November 15th at 7:00 p.m. This regular event at Clockwerks Brewing, hosted by Sam Spadino and Sidney Oxborough, represents the convergence of two geeky favorites: a steampunk-themed bar and absurd trivia. Trivia Against Humanity has also expanded and now has weekly events at Mortimer’s and Glam Doll on Tuesdays and Modist Brewing Company on Wednesdays. See the Trivia Against Humanity Facebook page for additional events. When: Thursday, November 15th and Friday, November 16th at 7:30 p.m.
Join Mystery Science Theater 3000‘s Frank Conniff and Trace Beaulieu for a night of movie riffing in classic MST3K style. This will be a two-evening event, with different movies being screened each night, and you can enjoy meet and greets before and after the showings. Tickets are $21.65, and include the meet and greets, photos, and autographs. When: Thursday, November 15th at 7:30 p.m.
Come see a 35-millimeter screening of the adventure film that was made as a love letter to classic serials, written by Lawrence Kasdan, George Lucas, and Philip Kaufman, and directed by Steven Spielberg. This film is exciting, fast paced, and uses a charismatic cast to a great effect. If you’ve never seen an Indiana Jones film, this is a great place to start! Tickets are $10. Warhammer and miniatures-gaming geeks can test their mettle at this weekend tournament hosted at the Crowne Plaza Minneapolis West. There will be narrative tournaments for a variety of games, including Warhammer 40K, Warmachine, and more, and expect beautiful terrain created by the event organizers. Prices vary, but a weekend badge costs $30. When: Friday, November 16th at 6:00 p.m.
Mischief Toy Store in St. Paul invites you to experience some Magic with them this Friday night for this Magic: The Gathering draft event. Entry is $15, and all players will receive prizes, including a “fancy promo card.” This weekly event is limited to 24 players and typically lasts until about 9:00 p.m. All skill levels are welcome. Mischief Toy Store hosts other events throughout the week, which are listed on Meetup and Facebook (check out the full calendar on the event page linked above). When: Friday, November 16th at 7:00 p.m. This show features vendors with new, used, vintage, and rare music, as well as comics, toys, memorabilia, and more. It’s a great show for music, comic, and all kinds of other geeks who enjoy collecting rare and hard-to-find pieces. This event is held three times a year and always brings cool new stuff, and Allen Beaulieu, an early Prince photographer, will be a special guest at this week’s event, so come check it out! When: Saturday, November 17th at 10:00 a.m. When: Saturday, November 17th at 6:00 p.m.
Whet your appetite for the sci-fi and fantasy goodness that MarsCon will be bringing in March with a night of fun with your fellow geeks. Have a ball, and enjoy music, costumes, and more! Admission is $10, with discounts given for food-shelf donations. So dance, enjoy some trivia, and get your geek on! When: Sunday, November 18th at 10:15 a.m. and 11:15 a.m. This class incorporates a variety of dance styles, including tribal fusion, Greek, American Egyptian, and world fusion and is taught by instructor Shannon (whom readers might know from Geek Slink Belly Dance). These weekly classes will help build a strong core and set of skills, and is intended for all bodies, all ages, all sizes, and is built on a platform of acceptance and inclusivity. Cost is $15. Please note: there are two different classes offered on Sundays. The 10:15 class is intended for all skill levels, and is forgiving for beginners, while the 11:15 class is for an intermediate skill level. When: Sunday, November 18th at 12:00 p.m. When: Sunday, November 18th at 12:30 p.m. Gender Jam—a meetup group for trans, gender-nonconforming, questioning, and intersex youth—will be meeting up for an afternoon of community and fun. This week, Gender Jam will be all about pampering, as participants take part in Spa Day! As always, bring your permission slip if you are under 18. When: Sunday, November 18th at 5:00 p.m. This weekly event gives families a chance to experience virtual reality, soda, and pizza for a special price at REM5 Virtual Reality Laboratories. This is a great opportunity for families of all types (K–12, college, etc.) to explore virtual reality in a great Saint Louis Park location. There’s a wide variety of possibilities here, including fun, education and more. See the website for more details. This event is $20 per person, which covers one hour of VR, pizza, and soda.